The 2019 Toyota Tacoma is a reasonably sized pickup truck that can provide both power and precision while looking bold, original, and downright stylish. As one of the only and strongest contenders in its class, the Toyota Tacoma has gained a loyal following, and this year should only continue to satisfy fans new and old. With a starting price of just over $25,000, the 2019 Tacoma is affordable and a fair value for those who don’t need as much power as some of the larger pickups on the market. Measuring to be 212-226″ L x 74-75″ W x 71-72″ H, the 2019 Tacoma is right in the sweet spot of where you want your truck to be if you don’t need it for consistent heavy lifting. For example, those that take their kids to school during the week, drive into the city for a business meeting, or enjoy the occasional weekend family vacation with the popup trailer will gain the most out of this model. It’s the ideal everyday truck that is convenient to use and gives just the right amount of power to pull its own weight and make daily life easier. Additionally, the 2019 Tacoma was built to last with its resilient body. The 2019 Toyota Tacoma is a mid-size truck with a lot of physical appeal thanks to its quirky yet bold design. 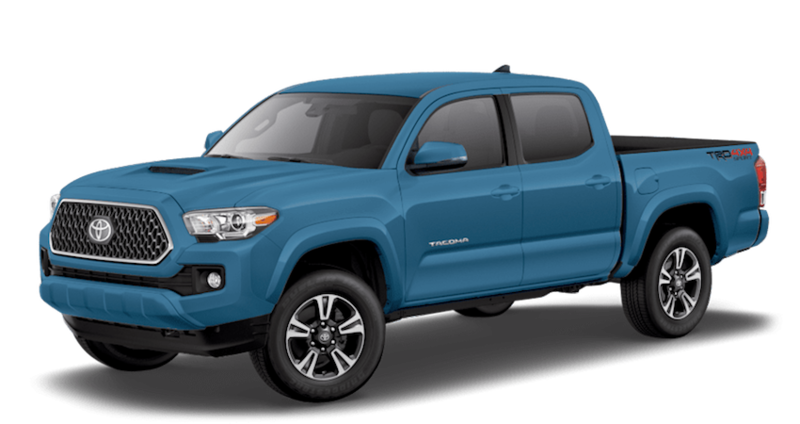 Many pickup trucks on the market today are cookie cutter designs that highlight nothing but how tough they are, but the 2019 Tacoma has a distinctive design concept that truly makes you think about where its true potential lies, given it a seductive quality beneath its boldness. The 2019 Toyota Tacoma is able to make a good impression no matter which angle you look at it. While the almost indescribable front design with its unmistakably bold grille and stern-eyed headlamps has a little something for everyone, and those that come to love it will have discovered something truly one-of-a-kind. Hitting just a few of the other highlights, The 2019 Tacoma also supports advanced visibility with its optional LED daytime running lights with projector-beam headlights, a large wheel opening for increased ruggedness, and the stamped tailgate for additional flare in the rear. So whether you are saying hello or goodbye, the 2019 Tacoma is sure to make a stunning impression. As for the interior, the 2019 Tacoma is fitted nicely with high-end technology and homey accommodations. The quiet tuning technology, in particular, will leave you and your passengers with a sense of calm as you enjoy the journey. When it comes to configuration, the 2019 Tacoma offers two cab types and two bed types. The 2019 Tacoma extended cab edition has a two full-sized doors, two half-doors and has limited rear seating with a significantly lower costs than its competitors. The 2019 Tacoma crew cab edition has four full-doors that provides ample rear seating space and has a larger engine size with stronger power output. The extended cab option comes standard with a 6ft bed while the crew cab comes standard with a 5ft bed that can be upgraded to the 6ft bed. The choice is really all about your personal lifestyle and how much you want to spend. Overall the 2019 Toyota Tacoma is a marvel that offers striking boldness and a unique design that will be sure to get heads turning at lightning speed to check out every angle. Toyota is known for its excellent innovation capabilities, and the 2019 Toyota Tacoma is no exception. Whether you prioritize safety, utility, or power, 2019 Tacoma has a list of technology-based features which are sure to gain your attention. When it comes to safety the 2019 Tacoma has got you covered; in fact, it is one of the things this model excels at. Just to start, every Tacoma comes standard with Toyota’s Star Safety System that includes vehicle stability control, traction control, anti-lock brakes, electronic brake-force distribution, brake assist, and smart stop technology. These features allow drivers to easily maintain control of the 2019 Tacoma at all times. In addition to that drivers can also invest in Toyota's Safety Sense technology that will help build awareness and keep drivers aware of anything that is happening around their environment. In the front you will be offered such sensor-based technology as pre-collision alerts with pedestrian detection, in back you will have a rearview camera with park assist capabilities, and on the sides, you will have lane tracking technology and departure alerts with sway warning. When it comes to safety the Tacoma is all about prevention, and the best way to prevent a collision is by increasing awareness and reaction time. Technology goes beyond safety though, as the 2019 Tacoma comes fitted with an available Toyota Entune infotainment system that is sure to thrill modern drivers with its innovative and intuitive tech. Instantly allow your phone and vehicle to become one as you access all your favorite apps through the 7-inch easy-to-navigate touchscreen display. Using the Entune app you can wirelessly stream your favorite music or pull up maps when you are lost. Additionally, you can make and receive calls and text without missing a beat. Never again will you feel lost, bored, or disconnected from the world as you drive the open road. Other upgradable tech features include USB ports throughout the cabin, a wireless charging station, a multi-information display for your cockpit, and dual-zone climate control for comfort. The 2019 Tacoma also comes with a built-in Wi-Fi hotspot that will allow you the ability to get work done from anywhere, or maybe just give you a way to look at your favorite cat videos. Technology is the future, and the 2019 Toyota Tacoma is ready to embrace it head-on. The 2019 Toyota Tacoma is always ready to perform when it comes to showing off its impressive power and off-roading capabilities. There are two engine options for the 2019 Tacoma; a 2.7L 4-cylinder and a 3.5L V6. The 2.7L 4-cylinder is the standard option that provides 159 horsepower and 180 lb-ft of torque. While this is a fair engine, many drivers will be tempted to upgrade to the 3.5L V6 that provides a much more impressive 278 hp and 265 lb-ft of torque. Both of these engines are fine, but it is difficult to invest in the 2019 Tacoma without upgrading to the thrilling V6 in order to bring it to its full potential. At its best the 2019 Tacoma can tow up to 6,800 pounds, that is ideal for loading up such things as small boats or 4x4s. But that is a small side note compared to its off-roading prowess and capabilities. The 2019 Tacoma is offered in either RWD or 4WD and can be fitted with a 6-speed manual or automatic transmission depending on your handling needs. Those that desire a little more adventure out of their life will find a deep satisfaction in what the 2019 Tacoma can offer. Some neat features include crawl control for getting out of sticky situations, electronic locking rear differentials for a strong grip, easy-to-use multi-terrain selection system with five modes, hill start assist, and the best shocks the automotive community has to offer. No one is going to just hand you the world, sometimes you need to go out and take it for yourself, and the 2019 Toyota Tacoma is the perfect ally in that mission. When it comes to Joseph Toyota, it is all about respect. Respect for vehicles, drivers, and even ourselves as professionals that strive to be the innovators of automotive culture. The main way we show our respect for the needs of drivers and the automotive community as a whole is simply by providing everyone who comes to us seeking help with a clear, honest, and informative service experience. No need for silly dealership games, all you need to do is ask, and we answer; it’s as simple as that. We also take the time to carefully listen to each driver so that we may get to know them on an individual level in order to give them a completely customized buying experience that is assured to lead to satisfaction on all ends. 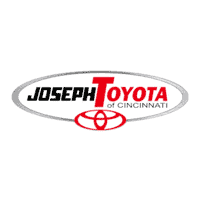 So if you feel like you deserve to be treated with more than just a little respect then Joseph Toyota is here for all your automotive needs.